WOW— what an incredible month we’ve had in the studio! We are so excited about the beginning of spring and warm weather. Take some time to enjoy God’s blessings by going for a run or walk outside! Don’t forget to turn in your March calendar when the month is over! We want to see how you stayed ABSolutely committed this month! You can bring your calendar in to the studio, email us a picture to transfitathens@gmail.com, or text a picture to our staff. When you complete a monthly challenge and turn your calendar in, we reward your hard work with a prize! We wanted to encourage you this morning to stay committed. Let’s run stronger together whatever race, whether it be the race of today or a real 5k, with perseverance, endurance, and heart! Whether we are physically running or not, we all run the race of life and give the honor and glory to God. Often, we are exhausted and want to quit but we have a finish line to cross so we must finish strong! He gave us these bodies and asks us to care for them, which we do by viewing exercise as a form of worship. Let us soak in the richness of the world He created! We hope you can join us for our lunch and learn on Thursday! Additionally, we have exciting news beginning next week, April 3rd! Pam Adams, our director of Spiritual Development and Outreach, will be leading a prayer walk every Wednesday in April at at 9:30 am. Stay tuned for our April news blog for more details! Relaxation: These poses in combination with controlled breathing lead to a slowing down within your body. This exhibits itself in a lowered heart rate which elicits a relaxation response and, in turn, helps lower anxiety, stress and insomnia. Stretches hamstrings and lower back: The angle of the body in these poses reduces the curve of the lumbar spine, which will elongate and stretch the back muscles. In poses like Legs Up the Wall, the closer your hips are to the wall, the more stretch you'll create in your hamstrings. Facilitates venous drainage and increases circulation: Elevating the legs promotes drainage from excess fluid build-up. In addition, gravity assists circulation by facilitating the return of blood back to the heart. Wednesday is the last day to register for the Lunch & Learn! The event will be on Thursday, March 28th. During this luncheon, we will cover safe and efficient running. Topics include form fundamentals, nutrition, running shoes and favorite running gear, and health benefits. 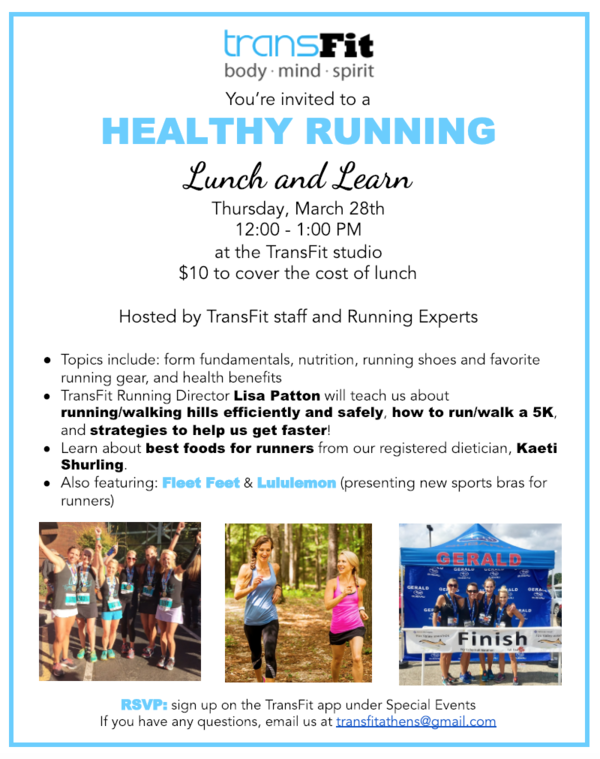 TransFit Running Director Lisa Patton will teach us about running/walking hills efficiently and safely, how to run/walk a 5K, and strategies to help us get faster! TransFit Registered Dietician Kaeti Shurling will teach us about the best foods for runners. We will also have Fleet Feet Athens and Lululemon here as guests! Lululemon is bringing new sports bras for runners. You do not want to miss this! The cost to cover lunch is $10. You can register on the free TransFit app under Special Events! Congratulations to our incredible marathon runners— we are SO proud of you! 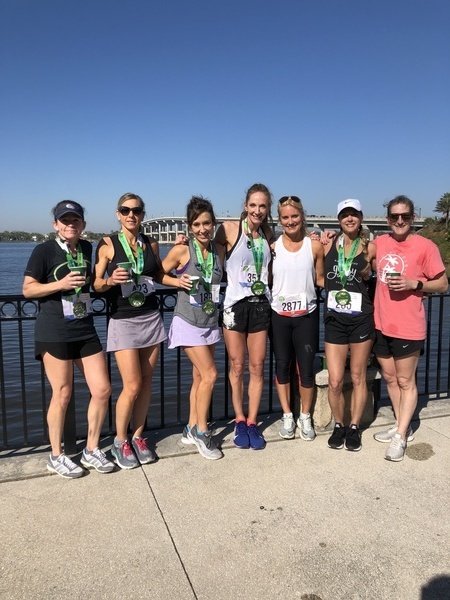 These ladies went down to Ormond Beach, FL to run the Tomoka Marathon over the weekend. They set a great example for us on using our bodies to worship our amazing God! Let’s take the dedication and drive we learn while training and apply it to the real life marathon we run each day for Christ! We can’t wait to see you in the studio throughout the rest of this week! We are finishing March strong and full of energy! 🙌 Exciting News to Come Alive in April!